Insider: Omega Seamaster Bullhead. 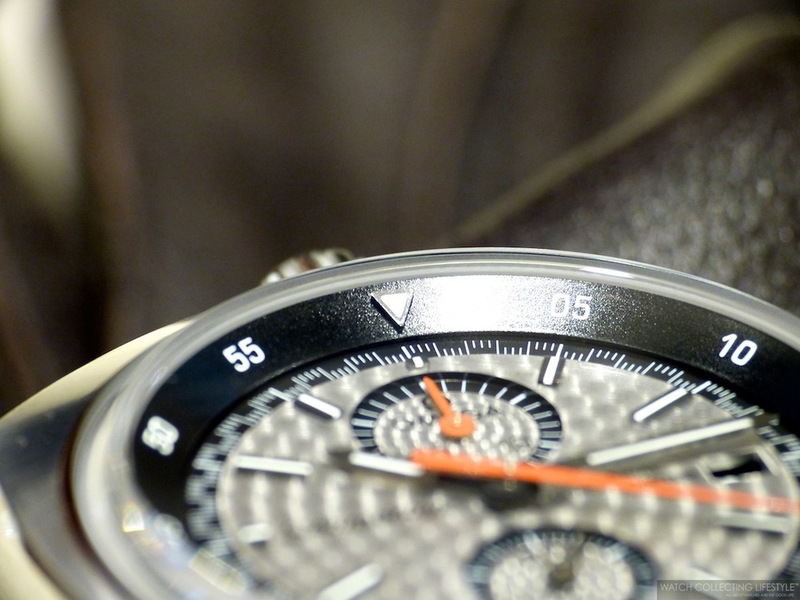 The Rebirth of an Iconic Chronograph. With a case and dial configuration unlike any other Omega; the original 1969 Seamaster Bullhead that inspired this wristwatch is among the rarest, most collectable and most recognizable chronographs ever produced. The Omega Seamaster Bullhead is fitted with a stainless steel shield-shaped case that measures 43 mm in length by 43 mm in width. The case features brushed and polished areas as well as sharp angles and a special angled curved shape on its back. The watch is fitted with an inner revolving bezel and the unusual placement of its chronograph pushers and crowns made it a favorite among watch aficionados in the late 60s and early 70s. Its winding crown at 12 o’clock was flanked by two chronograph pushers and it was this unique configuration that gave the watch its nickname as it resembles a bull head with its horns. There is also another crown at the 6 o’clock position that controls the internal rotating bezel. To meet a long-standing request from Bullhead enthusiasts, Omega reissued three versions of the iconic chronograph last year. The first Bullhead model ref. 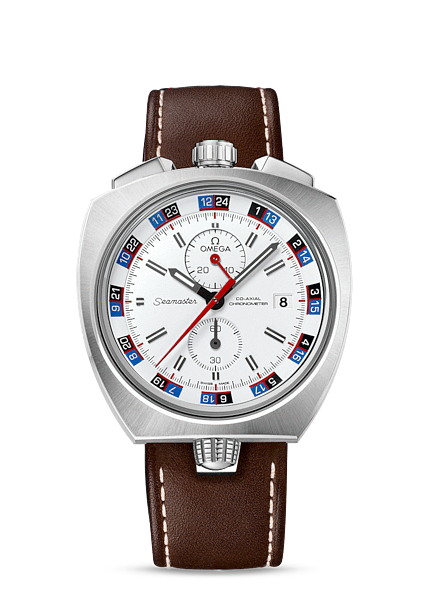 225.12.43.50.04.001 features a white dial with red accents, white bi-directional rotating inner bezel with a 24-hour scale and a day/night display with white numerals contrasted against blue and black backgrounds and a very nice brown strap with beige contrast stitching. The second model a.k.a. the "Sport Chic" dial Bullhead ref. 225.12.43.50.01.001, features a black dial with a reversed "Clous de Paris" pattern with red accents, black bi-directional rotating inner bezel with a 12-hour scale and a black leather strap with red contrast stitching. Lastly, the third model which is the one we are reviewing here, ref. 225.12.43.50.02.001 features a silvered “Rallye” dial with perlage, black perforated leather strap with red contrast stitching and a black 60-minute scale on its black bi-directional rotating inner bezel. All three models are priced equally and available in a limited edition of 669 pieces each. The "Rallye" dial on this watch is perhaps one of the most unique dials we have seen in any Omega watch and its the result of a labor intensive 'perlage' finishing job. While the pictures depict the hands being somewhat orange, the actual color of them is more of a burnt red. Unfortunately we had to review this watch under bright boutique lights instead of natural light. The dial features stick markers with luminescent material, a 30-minute chrono counter at 12, a subsidiary running seconds register at 6 and a date aperture at 3 o'clock. While the new models, with their characteristic symmetrical case and bezel, have all of the charm of the original, there are some modifications that were made. For instance, while the pushers for the chronograph are still mounted at the top, the round pushers on the original watch have been replaced with rectangular ones and the movement has been changed. While the original Bullhead from 1969 was fitted with a manual wound Lemania 930 chronograph calibre —where the right pusher was used to start/stop the 30-minute chronograph and the left pusher was used to reset the chronograph—, the new models are fitted with the Omega automatic calibre 3113. This new movement, besides being self-winding instead of manual wound, features a column wheel chronograph mechanism, co-axial escapement and a power reserve of 52 hours when fully wound. On the new movement the left chrono pusher is used to start/stop the 30-minute chrono at 12 o'clock and the right pusher is used to reset the chrono back to zero. The watch is fitted with a nice fluted screw-in crown and is waterproof rated to a depth of 150 meters. The crown at 6 o'clock rotates in both directions to move the inner bezel in clockwise or counterclockwise direction. The watch is fitted with a nice sapphire crystal with anti-reflective treatment on both sides that provides excellent readability of the time at any angle —just see for yourself. In order to maintain its robustness, the watch is fitted with a solid screw-in case back that is stamped with the familiar polished Seamaster Seahorse and the limited edition engravings. Something worth noting, is that the top part of the back of the case is slightly curved to position the watch on the wrist at an angle, allowing the wearer to look at the time without needing to turn the wrist and have the watch face you. You can appreciate that curvature on the third picture below. To complete its racing look, the new Omega Seamaster Bullhead 'rallye' is equipped with a vulcanized black leather strap with perforations and red contrast stitching matching the hands of the chronograph. 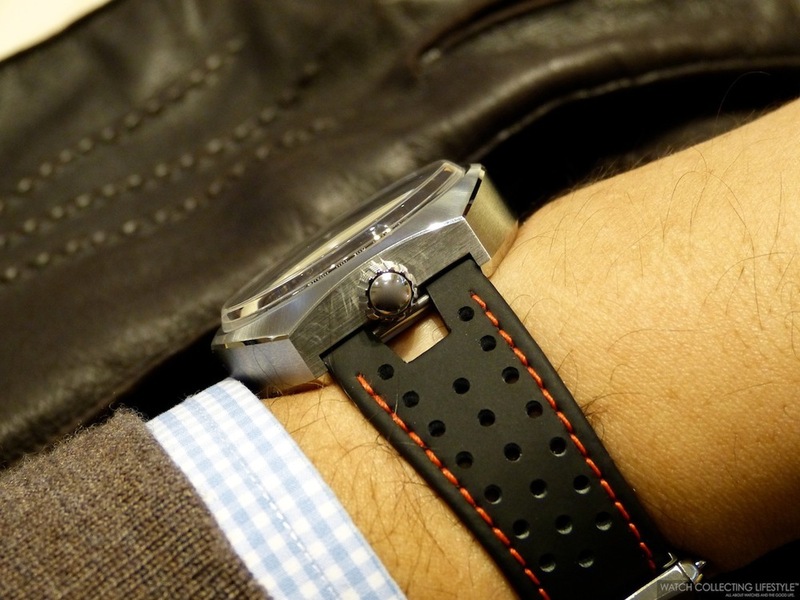 The strap is fitted with a deployant buckle with the Omega symbol on relief. On the wrist, the watch wears slightly smaller than its actual size but very comfortably. The fact that you can look at the time without having to turn your wrist all the way around is definitely a very convenient solution for those wanting to check the time while driving without the need to take their hand of the wheel. Just imagine yourself sporting this fascinating watch while driving an iconic Porsche 911 from the 60s. Wouldn't that be the perfect pair? Special thanks to our friends at the Omega Boutique in Chicago for letting us come and check this watch that just made it in. Sticker Price $9,600 USD. 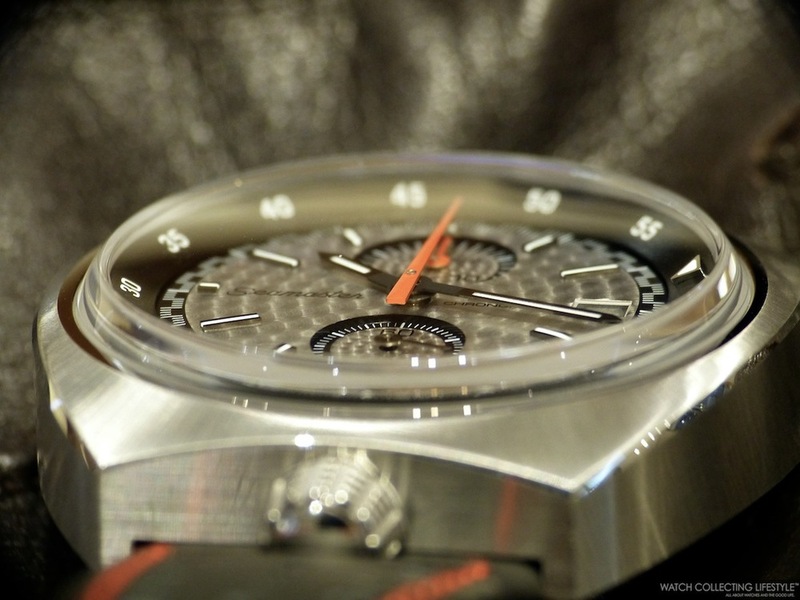 For more info on Omega click here. Posted on February 14, 2014 by Editor & Publisher and filed under Omega and tagged Omega Seamaster Bullhead Omega ref. 225.12.43.50.02.001 Omega ref. 225.12.43.50.04.001 Omega ref. 225.12.43.50.01.001 Omega Sport Chic Bullhead Omega Rallye Dial Bullhead.